On 24 October 2012, WTO’s Committee on Anti-Dumping Practice reviewed reports filed by 32 members on anti-dumping actions for the first half of 2012 and by 25 members for more recent submissions, a total of 75 issues. Among the 75 issues, for instance, Japan raised concerns about anti-dumping investigations by China on some stainless steel seamless tubes, by India on melamine and aniline, by Indonesia on cold rolled coil/sheet, and by the United States on maintaining anti-dumping measures against Japan that are 30 years old. The United States complained about China’s investigation into thylene glycol monobutyl ether and diethylene glycol monobutyl ether, and India’s investigation into stainless steel cold rolled flat products. 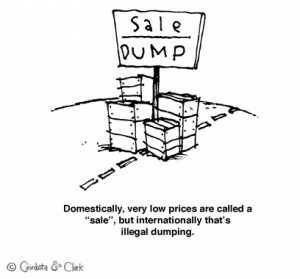 As fair as it may sound, anti-dumping practices can in fact be used as a strategic shelter for large domestic firms against foreign competitors.